Having a disability is a complex situation that is never understood by most people as it should actually be: an experience that enriches the life of the person having it. On the contrary – it’s seen as a condition that limits a human’ s life, that doesn’t allow that person to successfully integrate himself in society and that people need to be extra careful when around someone who has it. As surprisingly as it may seem, this type of behaviour is very offensive to people with disabilities. 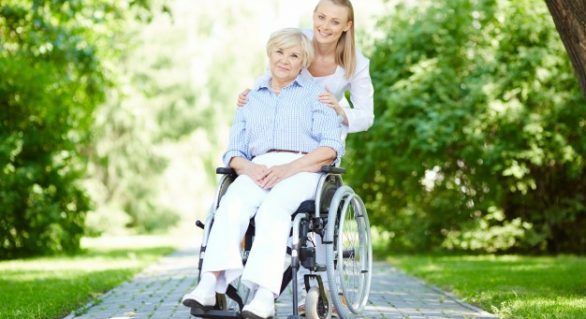 Not understanding the condition well can put you in a very uncomfortable situation when it comes to you taking care of someone with disability or simply when interacting with him. Many people tend to believe that communication with this vulnerable group of society is very easy and simple, but in fact it’s something you should prepare well for. It’s not like you’d need to do a miracle and change reality, but simply you should know how to present it in a way that won’t sound like you’re in any way repulsed by these people’s condition. One way to become a professional in communicating with people with disabilities is to get a training in the area and gain a disability certificate 4, which can open you a path for building a career in the field. Communication with people with disability is a rather complex process. What exactly will you be able to learn when you sign up for a course that offers a disability certificate 4? Well, as complex as the situation might be, you’ll learn how to work with people with disabilities in general. The legal and ethical frameworks that shape this area of expertise is also something you’re ought to be well-familiarized with if you want to contribute to the quality of life of these people. Also, you’ll learn how to empower them, create plans for their individual development and inclusion in the wider community. Most importantly, you’ll learn how to effectively communicate with them through developing augmentative and rather alternative communication strategies. A lot of people avoid people in wheel chairs for example, mainly because they don’t know how to talk to them and of fear of their disability making things awkward. How should they approach them or should they address the elephant in the room at all? Whatever the situation, the very first thing you should remember is that these are people before anything else. So you’re addressing people that may have problems with accessibility to certain places, or are in need of help when moving around. They would probably be no less professional than others, no less smart and no less polite and good. Or evil. You can never know, just like you can never know what kind of people are you surrounded by you in your everyday environment. Some people can easily praise on their ability to read people’s character and behavior lines, but when it comes to people with disabilities it is not that simple. Don’t go down that road – don’t assume anything about their desires and feelings. Instead, ask them directly if you want to learn a thing or two about these people. This also goes for cases when you want to know how to do certain things for them, what terminology to use about their condition, and pretty much everything you’re having doubts about. It’s important to use the ‘people first’ principle when talking to people with disabilities. This principle comes down to knowing how to master yourself around someone with a disability and control your language. Something like neglecting the fact that they’re in a wheel chair, but not act like it doesn’t matter to you. The above mentioned things still matter. You’d just ask about the obvious and then continue treating them just as any other human being, the only difference being that you’d be mentioning the mere fact. For example, “the lady who is in a wheel chair” or “the man who is blind”. You can see here that we’re addressing human beings, not disabled people, which would sound something like: “ the wheelchair-bound woman” or the “blind man” . As you can conclude from here, there are a lot of other aspects to learn when communicating with people with disabilities, so a course or a book or two could lead you on the right path.